This article is about the planet. For the campaign level, see Genesis. Genesis, also known as Nomos II, is a Forerunner world, the second planet in the Nomos system, artificially constructed by the Builders. It housed a secret gateway into the Domain and regularly produced "seed worlds" under the direction of its monitor, 031 Exuberant Witness. 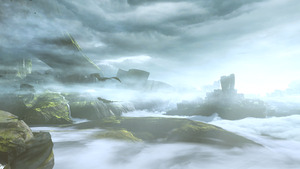 Before the firing of the Halo Array, Genesis was constructed by the Forerunner Builders as a manufacturer of "seed worlds", artificial planets used to house civilizations to ensure their continued existence. Natural satellites placed in orbit around the planet were mined, and new bodies were created using the resources. The planets were then populated with a diverse array of flora and fauna found on the surface of Genesis. A gateway to the Domain was hidden on the surface of the planet, surrounded by dense coral-like structures to mask its existence. This gateway was monitored and rarely utilized by the Forerunners, with most of their civilization not even aware of its existence, instead using passive conduits to connect to the Domain. Monitor 031 Exuberant Witness was installed on Genesis by the Builders to help maintain its systems and the secret gateway to the Domain. When the Halo Array was activated, the gateway closed and the Domain was believed to be destroyed. With the Halos' firing, Exuberant Witness was given charge of the entire installation and she halted Genesis' normal production of seed worlds. Genesis entered a dormant state and very little happened on the world for the following one hundred thousand years. "Genesis is really a magnificent planet. It's usually less… busy. Quite lonely, actually. But magnificent!" In 2557, after the destruction of the Ur-Didact's ship, Mantle's Approach, at the hands of John-117 and the smart AI Cortana, the ship and Cortana were pulled into slipstream space as a last ditch effort for the ship to escape destruction. Unbeknownst to John and the rest of the United Nations Space Command, Cortana had been uploaded into the Domain and "cured" of her rampancy. While in the Domain, Cortana came to the conclusion that the Mantle of Responsibility was meant to be claimed by herself and other artificial intelligences, not humanity, as the Librarian had originally intended. Once uploaded on Genesis, Cortana seized control of the world from Exuberant Witness, with the help of the Warden Eternal. Once in control, Cortana began activating the Guardians across the galaxy, calling them to Genesis to rally before dispersing them to populated worlds as a means to enforce the Mantle and her rule upon all races. Brought aboard a Guardian from Meridian upon Cortana's request, John and the rest of Blue Team soon arrived at Genesis. While Cortana wanted Blue Team by her side, the Warden Eternal disagreed and sent many Prometheans to battle the Spartans. Meanwhile, Spartan-IV Fireteam Osiris arrived at Genesis aboard a Guardian from Sanghelios, seeking to stop Cortana and find Blue Team. With the help of Exuberant Witness, Osiris was able to fight their way past numerous Promethean forces and located Blue Team at the Gateway. However, Cortana teleported Blue Team to her location and, after the Spartans refused to aid her, imprisoned them within a Cryptum. Using her link to the Domain, Cortana was able to disperse her Guardians upon the galaxy, taking control of the majority of charted space in the process and aligning many AIs with her and the Warden. However, due to the actions of Osiris, Exuberant Witness was able to retake control of Genesis and free Blue Team. Lumenon fly over Genesis' surface. "There's a formalness and precision to it all. It seems… artificial, but still organic." As Linda-058 noted during Blue Team's operations on Genesis, the topography of the planet appeared organic with an artificial flair to it. The plant and rock structures on the planet could be best described as "alien". It is obvious that the planet had been artificially constructed, not naturally evolved, as the world's rock formations have exquisite attention to detail on them. Genesis is home to a coral-like plant, known as fractal plants, which are abundantly found across the world's surface. Other types of vegetation include paddle grass, fiber optic succulents, aloe husks, floating lotuses, barrens, and warbled fans. To serve its purpose as a Builder refugee world, a variety of animal species were placed on this planet. The lumenon, a common creature found on Builder worlds, lived on Genesis and hunted smaller animals on the surface of Genesis' vast oceans. The logrodites were transported to Genesis to scavenge the world's surface for harmful bacteria and maintain the planet's delicate ecological balance. The term genesis refers to the mode of formation of an object, referencing Genesis' function for the Forerunners. For Halo 5: Guardians, 343 Industries sought to create an original alien planet that felt "like the logical manifestation of the Forerunner lore" with a lush alien environment composed of geometric patterns that are reflected in the gleaming architecture; the result was Genesis. To get creative inspiration, members of 343i's art team traveled to Iceland for a week of reference gathering. Genesis' final design was very different from its original conception, but the world did retain many influences from Iceland, including the country's waterfalls. Concept art of a Forerunner structure. A Forerunner entrance on Genesis. Another concept art for mountains. Concept art for Locke's arrival on Genesis. The lush surface on Genesis. A cavern guarded by Promethean constructs. A Forerunner structure requiring activation for the Gateway to open. The Master Chief engaging the Warden Eternal on Genesis. Genesis seen from a Guardian. Another view of the Gateway to the Domain.